Flyfishing in Alaska: - The Color of Paradise is PINK! The lure of grandeur, pristine watersheds and schools of large fish are what draws many flyfishing anglers to the 49th state. And although this can certainly be the case, a remarkable number of visitors find something completely different once they arrive. In many of the state's most popular fisheries, you may encounter traffic jams or waiting lines to parking areas, garbage strewn along the river banks and angler pressure that could only be described as "Combat Fishing." Enduring these conditions only to spend hours dredging off-colored water in the hopes that something will swim into their fly. The reason for this scenario is that many, if not most anglers, are limited by the sheer expense of getting away from it all and settle for fishing next to the road system. And maybe part of the problem is our choice of species we choose to pursue. King, Silver and Sockeye for instance draw intense pressure, while Pinks and Chum are generally overlooked in favor of the "glamour" fish. This is not without reason as the Pink and Chum are not generally considered to be quality table fare. And while this can be true of older fish taken in rivers far upstream, both species in or near the salt are very acceptable. So, if filling the freezer with Red salmon, or mounting a 60 pound King is the primary objective, the experience may be less than dream-like, but if non-stop action in pristine solitude is the plan, then look past the glamour. 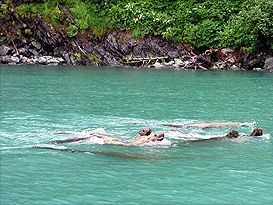 While fishing the backwater bays of Prince William Sound out of Valdez, I was struck by a weird comparative. I had rented a skiff at the Harbor and traveled 10 or so miles to a small bay with Pink Salmon on the agenda. As we approached, the sight of Pinks breaking the surface of the glassy saltwater let me know immediately we had come to the right spot. What I didn't realize at first was that the water they were in was less than 2 feet deep. I moved up slowly and cut the motor to drift several feet further into range of cruising schools of dime-bright Pink salmon. Mine was not the flyfishing adventure one would typically plan but rather a family excursion with wife, kids and sister in law. Regardless, the sight of them casting from the bow to cruising schools of fish immediately brought back memories of Bonefishing Ascension Bay six months earlier. As distant and different as the two locations and species were, this was remarkably similar to fishing Bonies on the flats. The water had become too shallow to move under power, so I hopped out of the boat to a hard sandy bottom and slowly pushed it toward the salmon we could see tailing the surface. The schools were easily visible through the clear water as they made random milling patterns. And, like fishing bones, my inexperienced family soon learned to cast near the head of the pack, make the retrieve and set the hook as they could watch bright Pinks break for and slash their shiny offerings. It was totally visual in every way. Again like the flats of Ascension, we were in totally pristine waters. But, instead of white sandy coves bordered by mangrove islands and endless blue skies, we were now surrounded by towering mountains that fell straight into the ocean. The waters were aqua blue, the vegetation lush, rain forest green and the peaks jagged, snow capped and glaciated. 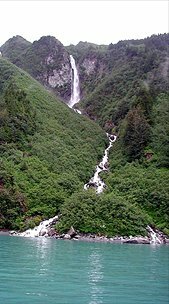 Countless waterfalls could be seen in all directions, plummeting off sheer mountains, crashing into the shoreline rocks just yards from where they'd meet saltwater. The blue skies of Mexico were gone in favor of overcast skies with whispery clouds hanging on rock walls, clinging to stands of spruce. The scenery could only be described as breathtaking. Near the town of Valdez, large numbers of anglers can be seen casting from Allison Point, mere yards from their parked RVs and campers, but the adventurous anglers can truly get away from the crowds by renting modestly priced boats at the Valdez Harbor. The craft are in good condition, reliable and come with depth and fish finders, an emergency radio, oars, anchor and safety equipment. You'll be given maps of Valdez arm and instructed where to find the fish. In addition to magnificent runs of Pink and Silver salmon, the waters near Valdez also afford excellent Halibut fishing for anglers wanting to mix it up. And although most visiting anglers won't bring the necessary tackle to handle barndoor Halibut, tackle and bait can be acquired from the boat houses. Fly tackle requirements are loose. Because Pinks are relatively small, heavy salmon gear is not necessary, but not necessarily bad either. The smaller outfits may be more pleasurable to cast for long hours and give more play, but the larger rods will punch heavier flies into the wind and land fish quickly. And I should note, just because Pinks are the smallest of the 5 Pacific Salmon is not to suggest they're pushovers on the flyrod. They're not! Pinks in the salt are rock solid and hell bent to tear things up. As for reels, line and flies - A good reel with a reliable drag will be appreciated. A floating, intermediate or sink tip lines will work very well in most of shallow water. For deep water a full sink would be the ticket, but I'd suggest sticking with the "if I spot'em, I got'em" theory and go for the silver bullets cruising the lagoons. Oddly, after a banner day on fresh Pinks I left not knowing what the hot fly was. They were all hot. In a general sense, they seemed to prefer flash, but presentation was the obviously key. If we could get the fly in front of a cruising pack (which were everywhere) then retrieve it away in the direction the fish were swimming, one would invariably bust out to attack the fly. Numerous times, more than one fish would break out and race to beat the other. Some would miss their strike, or we'd miss them and they'd turn around to hit it again. Wish I had a dime for every premature hook set that day. While traveling from bay to bay it seems there is never a moment when you can't see something unique or interesting in the arm. Bald Eagles become commonplace, over-shadowed by whales, otters and seals that playfully follow alongside the boat, or bears walking the beaches in search of an easy meal. A small commercial fishing fleet can be seen up close in their aging, brightly painted boats making sets for the same fish the anglers pursue. An occasional super-tanker may cruise by, making you feel oh so insignificant in your 18 footer as they pass toward port for another ten million gallons of crude. 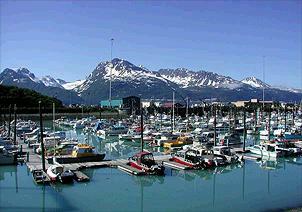 Lodging is abundant in the quaint fishing port of Valdez by way of hotel, motel, tent and RV camping. Or the seclusion minded can rent private or forest service cabins in the various coastal areas for modest fees. Local restaurants serve a variety of food, but I'd have to rate the fresh sea-food as "first rate." 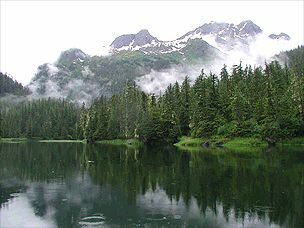 The quality of fishing in the Valdez arm is reason enough to go, but the extras make it an almost "must do" for anyone yearning to experience the real Alaska. Run Timing: Pinks arrive in Valdez Bay around mid-June, peak around July 4th, with fresh fish still available into August. While most of the pinks are Solomon Gulch Hatchery fish, many area streams support wild stocks of pink salmon. Anglers will find more pink salmon in even-numbered years (2002, 2004, 2006) because of their two-year lifecycle. Shore fishing is best off the breakwater beach near the harbor and along the beach at Allison Point. Anglers fishing by boat can catch pinks by casting along the shoreline off Allison Point. 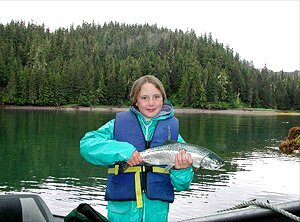 Pink salmon fishing is generally best within a few hours either side of high tide. Ranging from about 3.5 to 6 pounds, pinks provide excellent action on light tackle or fly fishing gear. Since they are aggressive biters and good fighters, pinks are a fun way to introduce someone to fly fishing for salmon, as well as providing excellent table fare when fresh or canned right away.